Handicapped-accessible bathrooms have to be large enough to accommodate wheelchairs and provide enough space for the chairs to be easily rotated. The ADA (Americans with Disabilities Act) also dictates the configuration of the fixtures in the room so they can be easily reached by wheelchair-bound people. Handicap-accessible bathrooms need to be large enough to accommodate wheelchair movement. The required minimum floor space for a handicapped-accessible bathroom is 30 inches by 48 inches. The space can provide forward or parallel access to the bathroom equipment, and part of the area can underneath the equipment as long as there is enough clearance for the knees and toes of the person in the wheelchair. For a wheelchair to make a 180-degree turn, it needs a space with a minimum 60-inch diameter. 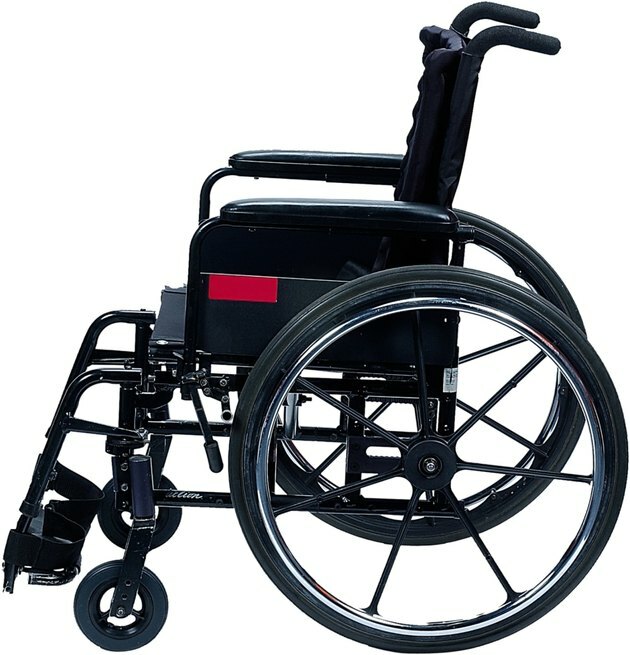 In tight spaces, aisles with widths of 36 inches that accommodate three-point wheelchair turns are acceptable, and the space can include areas underneath fixtures as long as the required knee-toe clearance is provided. In addition to floor space obligations, handicapped-accessible bathrooms must have doors wide enough for standard wheelchairs to pass through unimpeded. If the bathroom has an open, straight entryway, the door has to be at least 32 inches wide. However, if the bathroom is located off a hallway, and the wheelchair has to be turned to enter the room, a minimum 36-inch doorway is necessary. In addition to providing adequate space for easy ingress, egress and movement inside the bathroom, the sink must be at an appropriate level for handicapped access and operation. Sinks must extend outward from the back wall by a minimum of 17 inches and have open space underneath with a minimum 29-inch clearance from the apron bottom to the floor. The required floor space clearance has to be 30 inches wide and 48 inches deep for the wheelchair to fit underneath from a straightforward approach. The sink should be no more than 34 inches high and have no more than 2 inches of counter space between the front edge of the cabinet edge and the bowl of the sink for easy access to hand washing. Toilet seats must be between 17 and 19 inches off the floor and urinals no more than 17 inches high. The flush handle on both fixtures can be installed no higher than 44 inches from the floor and must be located on the most accessible side of the unit. If the units are enclosed by cubicles, the stalls have to be a minimum of 60 inches wide and deep enough for fixture access from the front or sides. Safety grab bars or comparable supports are required on both sides of the toilet or urinal. How Much Space Is Needed for a Toilet & a Bidet? What Is the ADA Requirement for Buildings With Stairs?